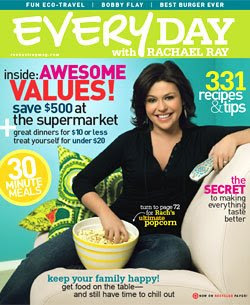 The April 2009 issue of Every Day with Rachael Ray is aimed at saving us some cashola while offering some outstanding recipes. In the Good for You feature, the magazine offers lightened up versions of Huevos Rancheros and Shepherd's Pie. In the $10 Spot, get recipes for Hot-Sauce Chicken with Grilled Green Beans (which I added to my list of recipes to try, Basted Eggs and Smoky Lentil Salad, Polenta with Kale and Portobello Mushrooms, Pan-Fried Pork Wontons with Spinach, and Lamb-and-Chickpea Falafel Sandwich. In the No-Recipe Zone, Editor-in-chief Silvana Nardone shares a family favorite - Marsala Chicken-and-Mushroom Casserole. In the star feature of the magazine (as far as I am concerned), you'll find the following 30 minute meals: Caesar Soup, Chicken Cutlets Milanese with Butter Beans and Gnocchi, Garlic Sliced Steak with Watercress and Horseradish Baby Potatoes, Orange-Balsamic Chicken with Asparagus, Green Beans and Polenta, Leeky Broth with Ravioli, Pistachio-Tarragon Pesto Bowties with Peas and Potatoes, Ancho-Black Bean Chili, Sunset Orzo with Spanish Shrimp, Artichoke Frittata, Pasta with Lamb-and-Cherry-Tomato Ragu, and Cacio e Pepe Popcorn. I got the new mag but then got this wretched stomach bug- haven't been able to anything with it yet, bummer! All these selections look great but I heard people should stay away from pistachio nuts right now because of the salmonilla scare. I wonder if I could sub pine nuts or maybe almonds in the "Pistachio-Tarragon Pesto Bowties with Peas and Potatoes." Thoughts?